This boxed set was released a few months ago (and has apparently sold out and they are doing another print run later this year) but this is a new blog and it's a product that I want to talk about in a post. 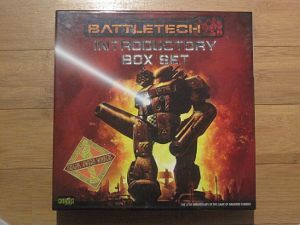 Battletech is something that I'm rather late to the game with. When I was a teenager 20 years ago I would see lots of mention of the game in gaming magazines (these used to come on paper you know) and would think it looked pretty cool. But I never got any further than that. The barrier to entry looked too great. You needed models, paints and terrain. Not to mention the rules looked pretty arcane from the outside (I didn't think at the time that AD&D was just the same for an outsider, I knew how THAC0 worked and I was happy). Fast forward 20 years and I dip in to Battletech a little by buying the latest edition core book Total Warfare. It whets my appetite a little for the game rules, and the fiction sections look cool. But the setting itself is still a little opaque to me, I start looking for ways to jump start me into a setting that's been growing for 25 years when I see on my favourite Australian internet games stockist that there is going to be a Introductory Box Set coming out soon. Great, I think, that sounds like just what I want. I check the website next month and it's still 'Coming Soon'. Next month it's the same, and the next. So I check out the website of Catalyst Game Labs and there doesn't seem to be much information there. I find out that there might be some issues at CGL and I hear rumors that I'm not going to repeat here and I get worried that it might not happen at all. Fast forward a few months and the word on the CGL website is that they have actually got the set printed and boxed and they even have photos of some of the boxes in their offices and I start getting excited again. Forget that I could have been spending the last few months getting up to speed with the background of the Battletech Universe (actually I didn't have time for that I had been running a D&D 4E game that was taking up a lot of my time), now was time to dive in to the world. The launch day of the product came and went and I waited for it to arrive in Australia (as is the way with living outside of the US) and when it did I snapped it up. And then waited for it to be delivered. And then it arrived. And I was blown away (figuratively, there's no actual futuristic weaponry in there). A lot of effort has gone in to this box and it seems that very little expense has been spared. There are no hard backed books in there, and it's advertised as having mostly non-premium plastic mechs in there, but it wouldn't have been affordable if they had put a whole load of metal mechs in. The box feels like they really care about the game, it is pretty solid and the inside sides have lots of photos of painted versions of the included mechs. The booklets all look great and the hex boards, of which you get two double sided ones, are excellent. 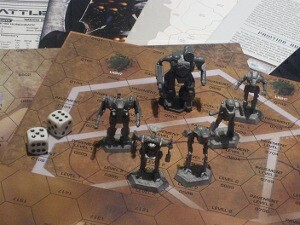 They are on very think card and have this kind of non slip surface which is great if you roll dice on them near mechs. It includes 20 plastic mechs which run the range from light fast mechs to slow (oh so slow Atlas) heavy mechs with a lot of firepower and two premium plastic clan mechs (Thor and Loki). I haven't got a lot of photos of my set but Bartoneus has a review on critical-hits.com that includes some good photos at Critical-Hits. Also in the box you get one set of Quick Start Rules. These are 12 pages and will get you playing this so called opaque, hard to learn game in less than an hour. They really will. They also look pretty well designed in that they leave you hankering for more complexity with things like firing arcs, movement and close combat. They do make a good game though by themselves though. Next is the Introductory Rulebook. This takes you further down the rabbit hole and gives you a fair chunk of the core rules that you find in Total Warfare for straight mech combat and the equivalent of the quick start rules for vehicle and troop combat. You could get pretty far just using the rules in this book. There's also a card full of tables which is useful for this table heavy game. The other books said there would be two cards but I only got one. I didn't mind. There is a booklet full of mech record sheets for all the plastic models included for use with the Introductory rules, and a few for use with the quick start rules. Next we have a painting and tactics guide. I thought that I wouldn't bother painting any of these. I'm not great at painting models and miniatures. But after reading this booklet I can't help but get excited about it. I haven't tried it yet, but I will. The tactics all seem sound, some obvious to me after seeing the rules, some not so. But they do give beginners a better chance of levelling the playing field a little if they want to play against more experienced players. What, however, really makes the set complete for me is the Inner Sphere at a Glance booklet. This is what I was looking for. 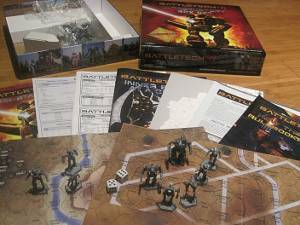 It takes you through the history of the Battletech universe from present day to 3067. It gives you background on all the houses of the inner sphere as well as other powers in the galaxy such as mercenaries, ComStar, the Clans and others. It talks about how the mechs work, how they are transported to missions, what type of missions they undertake and technical readouts for all the mechs included in the box and in the record sheets. This got me up to date on the world and ready to dive in to all the other resources available for this wonderful setting. Last but not least is a poster map of the inner sphere which after reading the background book is comprehensible and pretty interesting. And very pretty. There is also a pamphlet which tells you how the rule books of the system work together and a couple of dice. The art throughout the product is pretty awesome and is in keeping from what I've seen of the rest of the line since CGL took over the Battletech license. Overall I am very impressed with this set and it was well worth the wait (it's possible that the wait made it even better, but all publishers please ignore this sentence. Especially those with marketing departments). I love all the background information for a game setting (and much prefer that to lots of books with new feats and powers WotC). Battletech has all the fluff I want, and it certainly has all the crunch I want. Not to mention that I may be being drawn in to a previously unlooked for model painting hobby (we'll see how the frustration goes on that one). I'm looking forward to playing the RPG next. Edit: Here's a totally different opinion on this product.